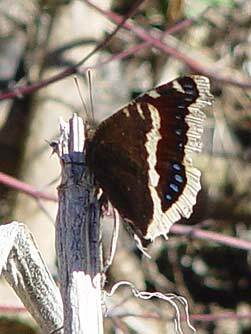 Mourning cloak butterflies (Nymphalis antiopa) rely on a wide variety of host plants for their caterpillars including willow, hackberry, wild rose, elm, apple, birch, alder, maple, poplars, spiraea, and other trees and shrubs. 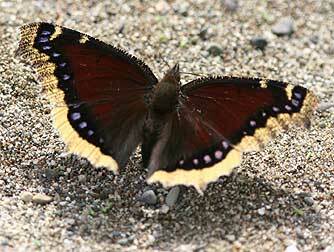 They are among the most widespread butterflies. 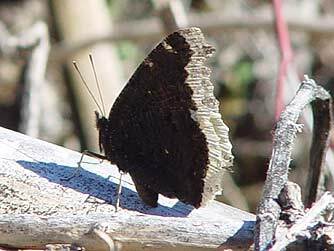 Some of these photos were taken in March where a few mourning cloaks had taken to the wing along a brushy creek valley on a warm weekend . One cloak would fend off a Milbert's Tortoiseshell from its regular perch in a mixed patch of nettles and wild rose near a quaking aspen (a poplar) and a hackberry tree. By the end of the weekend, the number of insect-eating birds in the area increased dramatically, and despite continued warm weather, all signs of mourning cloaks disappeared up and down the creek valley.